Wind Turbines on a Wind farm produce clean energy. Taken in Wyoming. Global energy markets are reaching a tipping point. A pathway has opened for climate progress, but only if governments; business and public's recognize and exploit the opportunity. For the first time, a large fraction of the world's fossil fuels could be replaced at a lower cost by clean energy, with today's renewable technologies and prices. And virtually no further investments in fossil fuels make long-term economic sense because higher fossil fuel prices over their useful life will be exorbitant. Early awareness of that reality is driving major energy growth markets to look past the fossil fuel monopoly of the 20th century. The newly elected, pro-business Indian government of Narendra Modi, as its first policy initiative, promised to provide roof-top solar to 400 million off-grid citizens. Modi is also slashing fossil fuel subsidies with their skyrocketing fiscal and trade deficits from imported coal and oil. The Chinese government signaled its intent to cap overall CO2 emissions in its next five-year plan. The private sector is joining in. Barclay's Bank recently downgraded the entire U.S. utility sector in fear that it would not respond to the disruptive challenge of distributed solar. Global banks are abandoning their intended financing of a major coal port at Abbot Point in Australia. International oil companies, after binging on ever more expensive and extreme oil plays pulled back sharply, as mega-project after mega-project was cancelled or delayed. "We have to curb costs, as we can't count on oil and gas prices' continuing to rise," Total's chief executive, Christophe de Margerie told investors. Total was joined by BP, Chevron, Shell, Statoil. Even giant Exxon sold off its major investments in U.S. light-tight oil. The latest Bloomberg New Energy Finance projection suggests that 2/3 of incremental global power generation over the next fifteen years will come from renewables. Declines in coal use in developed economies will be sharp enough to cut the global share of fossil fuels from 64 percent today to only 44 percent in 2030. Until recently transportation was different -- there were no cheaper clean alternatives to oil except for shifting from road to rail. But the electric vehicle revolution, partnered in the U.S. with cheaper shale gas, means that oil at $110 a barrel is no longer the cheapest fuel -- EV's, natural gas and ethanol are already cheaper for the driver. Goldman Sachs projects that with intelligent policy support -- not subsidies -- 40 percent of the US light duty fleet would be EV's by 2050, with internal rates of return above 15 percent. While these sounds like large numbers, they are clearly inadequate from a climate perspective -- worse, they are far lower market shares for clean energy that least-cost economics would warrant. The Bloomberg power projection, for example, still leaves the world investing $2.6 trillion in fossil fuel electrical generation, mostly natural gas in the U.S. and coal in Asia. Bloomberg expects that coal will increase its market share in the Indian and Chinese power sectors -- even though it would be cheaper for these countries to move towards renewables much more rapidly, because wind and solar will be cheaper at the margin than coal and gas for most of the lifetime of any new power plants built in the future. In country after country, fossil fuels still retain market share no longer justified by cost -- the precipitous drop in the price of renewables, accompanied by the escalating marginal cost of extracting oil, gas and coal, have created a fundamentally new market dynamic in which fossil fuels hold on in spite of the fact that they are more expensive, not cheaper. These "renewable edge" markets are now much bigger than the current renewable share. Electricity currently provides only 1 percent of global transportation energy; EV's and rail could today replace the first 15 percent of the oil used by cars and trucks at with an internal rate of return higher than 15 percent. Fossil fuels generate 63 percent of the world's power, renewables less than 5 percent, but 1/3 of fossil electricity now costs more than competing wind and solar. Older, outmoded coal plants, along with electrons generated by oil, LNG, and marine coal no longer make economic sense. Profitable building retrofits would cut fossil fuel used for heating and cooling by 20 percent, and displace another 15 percent of fossil fuel electricity demand. Fossil fuels are thus no longer the lowest cost energy source in enough of the world's energy markets to enable disruptive clean energy technologies to scale at a rate which would give them overwhelming market-wide competitive advantages in a relatively short time frame -- if markets responded competitively to price signals. But incumbent energy markets may not in fact harvest much of this renewable edge, because they are not price driven. Why are investors poised, according to Bloomberg, to put $2.6 trillion into new fossil fuel power plants? Why is the oil industry still investing $674 billion a year in looking for new, and increasingly unaffordable, reserves? Why is investor behavior lagging price signals? There are several factors. Advanced energy markets are quasi-cartels, and incumbent fossil interests obstruct market transitions. American public utilities are waging war on their own customers who choose cheaper rooftop solar, seeking to tax them out of the market. Or try buying $3.00 E85 instead of $4.35 gasoline for your flex-fueled vehicle at an Exxon station. In emerging markets raw energy is not enough -- new infrastructure must be built to get that energy to consumers reliably when they need it - transmission lines, substations, pipelines, refineries. Hard infrastructure must be accompanied by complex administrative and economic mechanisms -- rate regulation, credit arrangements, pollution standards, land use and leasing regimes. The problems posed by renewables -- generation intermittency, surface leasing rules for wind and solar farms, net metering -- are not necessarily more difficult than those posed by base-load coal plants -- fuel supply and storage, pollution damage or labor stoppages, grid failures, inability to meet peak afternoon loads. But the problems associated with fossil fuel energy are old problems, with established solutions and the security of being "proven." Disruptive clean energy solutions pose new kinds of challenges. Ossified energy bureaucracies would rather deal with intractable old problems, rather than wrestle with potentially much easier but innovation dependent new ones. (It is remarkable how often the "intermittency" of solar power is cited as a barrier to its growth in India by people who routinely back up their local grid with diesel, in a country where the biggest brown-out risk is on hot summer afternoons when solar is at its most reliable, and where almost any local solar array is more reliable). And, the economic chatter of market fundamentalists notwithstanding, market lag is normal. For example, most analysis suggests that solar or wind should only displace coal or gas as investment choices AFTER they become cheaper and "grid parity" is achieved. That's logical if you were building a power plant that could be equally well fuelled by wind, sunlight, natural gas or coal -- buy the cheapest fuel today. But if you build a fuel-specific power plant based on today's costs, and it operates for twenty years, you can easily blunder, because you have to pay tomorrow's much higher cost for fuel most of the time, as Japanese importers of Qatari LNG are doing today under their old contracts. This chart contrasts the costs of building a solar vs. natural gas plant in 2012, operating it for 25 years, assuming that grid parity occurs in 2017. 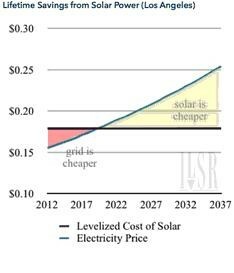 A solar power plant costs the same $0.18 for the whole life of the project. A gas plant starts cheaper -- at $0.155 -- but gradually climbs with the price of gas and inflation to $0.25 by the end of its life. The red area -- savings from cheaper gas power for the first five years -- are dwarfed by the light pink area -- savings from cheaper solar power for most of the project life. In most markets parity between clean and fossil energy is projected occur within 7-8 years. Infrastructure lasts for 25. So almost no new piece of fossil dependent energy infrastructure -- vehicles, power plant, transmission line, and building -- will pay off on a lifetime cost basis. 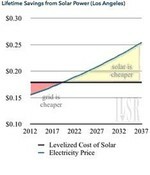 Market true-believers may argue that this could not be true -- if solar plants would generate cheaper electrons in India over a 25 year period Indian utilities would build them. But that version of market efficiency is preposterous. The world is cluttered with bankrupt projects built on the basis of outdated assumptions about the future. What is true is that companies -- or countries -- who see the clean energy revolution and act on it sooner will have much better balance sheets in 15 years than those who stick with a sinking fossil ship. It's time for climate advocates to start pointing out what the data makes obvious -- with no price on carbon, clean energy should still be replacing fossil fuels as fast as we can get it built -- and future investments in new coal plants, or finding new $120 oil -- are going to be stranded assets, whatever the world does about climate change. We aren't asking for sacrifice -- just common sense.